Negar is a DPhil candidate and a Departmental Lecturer in Human Geography. After several years working as an environmental and social executive for an international development project in South-East Asia, Negar graduated in 2012 with a first class degree in Environment and Development from King's College London. 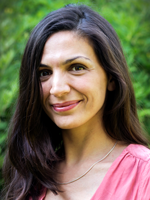 Negar is a French/Iranian feminist political and development geographer trained in the UK. Her work brings the insights of feminist political ecology, labour geography, and the sensibilities of an ethnographer to issues of work, migration, resource struggles, gender and Muslimness in the Global South, and the post-Soviet Muslim South. She undertakes empirically grounded research on topical development issues with marginalized communities - women, men and children informal and precarious laborers in mines in post-Soviet Tajikistan, women Afghan migrants. Her work fosters conversations between different strands of feminist geographical research: geographies of Muslim identities, postcolonial geography, political ecology, labour geography, children and youth geographies and feminist geopolitics. Negar is also an aspiring documentary filmmaker. Negar's current doctoral research explores the working lives of men, women and children in a context of politico-ecologic transformation in post-Soviet Tajikistan. This research is based on eight months of ethnographic fieldwork in Kante, a village in Tajikistan. In Kante, illegal coalmining and migration have developed alongside the opening of an industrial Sino-Tajik coalmine since the fall of the Soviet Union. In observing gendered work and resource struggles, Negar's research challenges the retraditionalization narrative on gender in Central Asia, which focuses on an Islamic revival as responsible for a retrenchment towards patriarchal norms since the fall of the Soviet Union. Instead, her work investigates how gender, Muslimness and tradition are reconfigured in the wake of broader politico-ecologic transformations and their local impacts through work and resource struggles. Her research has so far developed into four main themes: (i) a historical feminist postcolonial geography reading of discourses and material lived experiences of Soviet women's work (ii) a feminist emotional political ecology of resource struggles, masculinities and gendered exclusions (iii) questions of dirty/abject work amongst Muslim women miners and theoretical development of notions of Muslim women's agency (iv) questions of child labour in mines, gender and intergenerationality. Negar has also recently co-organized an interdisciplinary conference on Extraction/Exclusion at the University of Oxford. This conference gathered fifty international scholars to think about the types and forms of exclusions that continue to be produced by extractive (mining/oil & gas) projects and operations in the world. The proceedings of this conference are currently being gathered for an edited collection on pathways towards a decolonial resource geopolitics. Negar teaches on the Preliminary Core Module 'Geographical Techniques' course, and on the Final Honours Schools options 'New approaches to the Urban', and 'Digital methodologies (Focus on videographies). She also contributes to the Final Honours School fieldtrip to Berlin. Negar is also a tutor at Mansfield College: she gives tutorials on the Preliminary 'Human Geography' course, on the Final Honours 'Society, Place and Space' course. She also gives dissertation preparation classes, revision classes and supervises undergraduate dissertations.